I loved Empress Of The Night, the latest novel about Catherine The Great by Eva Stachniak. So, I was thrilled when Eva agreed to do this interview. 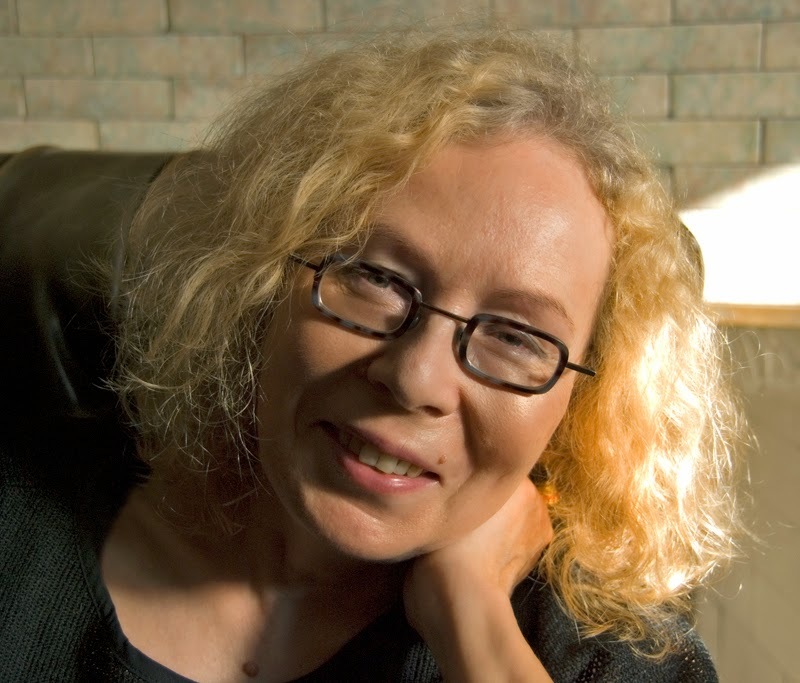 Born in Wrocław, Poland, Eva later moved to Canada, where she worked as a radio broadcaster and English and Humanities lecturer, before embarking on her writing career. 1. Empress Of The Night is your second novel about Catherine The Great. What is it that fascinates you so much about her? Having written two novels about her, I can say that Catherine the Great has been the best empress Russia has ever had. She survived dangerous palace politics and secured her own position. She managed to rule a vast empire and her sprawling, conniving court. She knew the price of power, and was willing to pay it. But she was also a passionate and articulate woman who loved and suffered heartbreaks as well as triumphs. 2. Why did you name the novel, Empress Of The Night? I wanted to reflect the reality of the last days of before her death when, paralyzed by a massive stroke, this once all powerful monarch, had to face her darkest thoughts. 3. In Empress Of The Night a dying Catherine is reminiscing about her life. Her thoughts flow freely and don’t follow a strict chronological order. This makes for an engrossing, if somewhat disjointed, read. What made you decide to adopt this style of writing? 4. How did you conduct your research? Did you need to travel to the places you wrote about? What sources most influenced you? I started from reading Catherine’s biographies, as many as I could locate, for each had something unique to add to the picture of my remarkable heroine. I also read memoirs of 18th century courtiers and travellers to Russia. Stanislav Poniatowski, Catherine’s Polish lover whom she made King of Poland, wrote about his stay in St. Petersburg, so did Prince Adam Czartoryski, who was there at the time of Catherine’s death. I particularly loved The Russian Journals by the Wilmot sisters, because these two Irish guest of Princess Dashkova provided me with a myriad of domestic details of Catherinian Russia. I read also Catherine’s letters, and letters Prince Potemkin wrote to her. Anything that allowed me to immerse myself in the life of her court. Yes, I do need to travel to be fully present in the places my characters live. I went to St. Petersburg armed with a long list of what I wanted to see. I walked through the city learning its topography. I visited the suburban palaces where Catherine spent her summers. I went to museums, parks, took a boat tour of St. Petersburg rivers and canals. It’s hard to say which of these sources influenced me most. Each offered a unique, irreplaceable perspective. 5. Have you made any fascinating or surprising discovery during your research that didn’t make it into the book? Many details never made it into the book, just because there were so many of them. Like the fact that Empress Elizabeth Petrovna kept a cow on the roof of the Winter Palace and went there to milk it when she felt she needed to get in touch with what she liked to call her love of simple, peasant life. My most surprising discovery was Kunstkamera, Peter the Great’s first Russian museum. It is mentioned in the novel, but of course I could not use all Kunstkamera stories. Under Peter the Great all manner of “monsters” lived there: giants, dwarfs, Siamese conjoined twins. Hermaphrodites. Sometimes they escaped their golden cage. Most of them died “in captivity,” ogled by visitors. Each of them could tell a fascinating story. 6. Catherine the Great divided Poland. You grew up in that country. What did you think about Catherine before you started doing your research? And after? Did you feelings towards her changed? In Poland, Catherine the Great was never absent from our collective memory. I grew up hearing of her as a harridan, a terrible, cruel Tsarina who, conniving with Prussia and Austria, wiped Poland off the map of Europe. I knew very little of Catherine’s life then. Only when I was researching my second novel, Garden of Venus, in which Catherine the Great appears briefly, that I picked up a copy of her memoirs. Her voice captivated me from the first sentence: Fortune is not as blind as people imagine. It is often the result of a long series of precise and well-chosen steps…. On the pages of this remarkable memoir Catherine was not just a powerful Empress, but a woman who tried to justify her life and her choices. I’d say that my research allowed me to look at Catherine from a more universal perspective. She was a Russian monarch and she tried to do rule Russia the best she could. Russia’s victory meant the defeat of Ukraine, Ottoman Porte, and Poland. The more I learned about her, the more I liked her, even if I did not approve of all her decisions and choices. 7. If you could invite three people, dead or alive, to dinner, who would you invite and why? Catherine the Great, because I’ve spent the last five years imagining her life. To make sure the dinner conversation sparkled with wit, I would also invite Grigory Potemkin. And then I would add someone from more recent past, someone like Sergey Pavlovich Diaghilev, the impressario and artistic director of the Ballets Russes who astonished Paris when he brought his fiery Russian dancers to pre-WWI France. A novel inspired by the life of Bronislava Nijinska, who was not just Vaslav Nijinski’s younger sister but a brilliant dancer and choreographer herself. She grew up in Russia, graduated from the Imperial Ballet School in St. Petersburg, danced at the Mariinsky and then at Diaghilev’s Ballets Russes. And, because she emigrated to the US in 1939, her personal archive is in Washington. DC, at the Library of Congress. As you can probably guess, I’ve already been there. You can purchase Empress Of The Night on Amazon. To keep up with Eva, visit her website, and follow her on Twitter and Facebook.